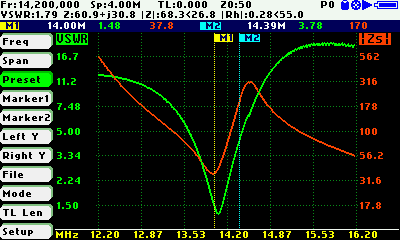 A single amateur band tested, with the VSWR result shown in green. This antenna (a Buddipole dipole) is well tuned to work on the 20 metre amateur band. So far, in my campaign to get operating using a software-defined radio (SDR), I have been using a lovely ELAD FDM-S2 receiver with my old and rather neglected fixed antenna system. Having bought ELAD’s companion transceiver, the FDM-DUO, I needed to check the state of my old fixed antenna, and select some portable antennas which I can use on nearby hilltops and beaches. Before introducing the antenna analyser which I have been using, the Sark-110, I will briefly outline why this is so important; if you are already a licensed amateur radio operator, you should probably skip the next section(s). In theory at least, any bit of conductive material which is stuck into the air (or ground, or even water) will pick up radio waves which can be fed to a receiver. However if you want to do anything more ambitious than listen to a local high-power commercial radio station, and if you want to be able to transmit yourself, you have to ensure that your antenna does the best job possible, and is matched to your transmitter. 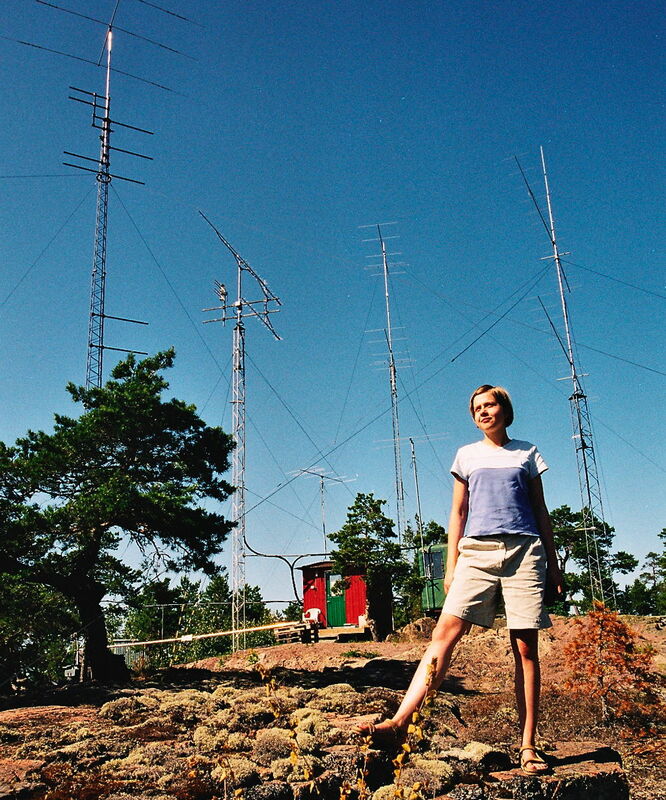 An amateur radio station, operated by callsign SP5HNK, on the Åland Islands. By Henryk Kotowski Kotoviski, via Wikimedia Commons. There are very many different designs of antenna, from long wires strung up in the air, to tall vertical whips or poles, and arrays of ‘Yagis’ with multiple elements on each boom. Each tries to focus on a frequency bandwidth (sometimes more than one), which increases signal strength within that bandwidth, and reduces strengths outside it. So not only should the stations that you want to hear be stronger, but those you don’t want to hear should be weaker. One fundamental measurement we must make on each antenna is the bandwidth over which it is most sensitive, so that you can tune the antenna to adjust that, as necessary. Another fundamental test which must be done on more complex systems – my home station is a good example, with cables that run for tens of metres by a stream, through pipework, and up a mast – is the condition of the cable connecting the antenna to the radio. I cannot physically inspect much of that length, and even if I could, I couldn’t see inside its sheath. However I need to know that it will transfer very small signals accurately, and match the antenna properly to the radio: most radio transmitters expect to ‘see’ an impedance of 50 Ω, which is what a good coaxial cable will provide. What would also be very useful, but is unfortunately much harder to obtain, is a chart showing the directional sensitivity of the antenna. Some antennas are fairly omnidirectional, and will receive and transmit signals equally through the full 360 degrees around them. That is fine for working with strong signals, but if you want to hear far distant and less powerful transmitters, and if you want those stations to hear your transmissions, then you will want an antenna with directionality – with a ‘front’ or ‘lobes’. You can then point the antenna in the right direction, and the signals that you want to detect should be much stronger. So, whilst the radio is very important, the antenna is actually the most crucial part of a radio system. If it is tuned to the wrong frequencies, or there is a break in the cable connecting it to the radio, the whole system will perform very poorly. Indeed if you transmit at higher power through a badly tuned antenna, much of that power can be reflected back through the cable to the radio, and can damage the radio. In this work with SDR, my plan is not to use high power (100 W or more output), but to use much lower, around 5 W maximum, termed in radio code QRP. But when I transmit, my signals will be competing with others who are running 100 W, 400 W, or even 1000 W or more. So what I lack in power, I must make up in effectiveness, particularly at the antenna. When a transmitter sends a varying (oscillating) signal along a cable and into an antenna, there will be a measurable transfer of power out towards the end of the antenna, and another which is reflected back from there to the transmitter. If I put a meter with its own low-power transmitter at the same end of the cable as the transceiver, that can measure the power in terms of voltage travelling forward from the transmitter to the antenna, and the voltage travelling back from the antenna. The ratio of the sum of the voltages over their difference is termed the voltage standing wave ratio (VSWR). If it is 1, then there is no power coming back from the antenna, and almost all the power from the transmitter should end up as radio waves – which is what I want. The higher the VSWR is above 1, the more power is being reflected back rather then being transmitted from the antenna, so my radio signal will be weaker than it could be. When I tune an antenna to optimise its VSWR, I am trying to get its VSWR over the band in question towards a value of 1.0, with values below 1.5 being perfectly acceptable. If I cannot tune the antenna to obtain a VSWR below about 2.0, then I will need to use some sort of additional antenna tuning unit (ATU) between my transmitter and the cable, so that the transmitter will still see the right 50 Ω impedance. I therefore need a device to measure the VSWR. Until fairly recently, the standard way to measure the (V)SWR and tune an antenna was to buy (or make) an analogue meter, which consisted of a very low-power radio transmitter to send a test signal along the cable and antenna, and a measuring system for the (V)SWR which displayed it on an analogue meter. To measure your antenna, you connect the meter in place of your radio, set it to the frequency in question, and adjust the exact frequency whilst watching the meter. This is not difficult to do, but you don’t have any graphical record of the (V)SWR values across the band, unless you laboriously record them off the meter, stepping through a series of different frequencies. If you have an antenna which covers two or more bands, it becomes very tedious and slow to cover them all. Furthermore if the (V)SWR values are seriously high, you cannot tell whether the antenna or cable is at fault, or where the problems are. The Sark-110 system, with its connecting adaptor tail. The plug at bottom right is shown for scale only. The Sark-110 Antenna Analyser is a thoroughly modern take on the SWR meter, and more, known more precisely as a vector impedance antenna analyser (VIAA). Smaller than most mobile phones, it has a 3 inch TFT LCD display, and a set of six controls along the upper edge of the case. Inside, it has a direct digital synthesis (DDS) signal generator which produces radio-frequency output ranging from 100 kHz up to 230 MHz (frequency resolution 1 Hz), so covering all the amateur HF bands, plus 6 and 2 metres. It is therefore a miniature SDR on its own. With its own processor and 2 MB of internal Flash storage, you can use its accessible menu commands to obtain (V)SWR and related measurements plotted across almost any frequency range up to 230 MHz. These make tuning a quick, interactive, and highly efficient process, at the end of which you can see exactly how your antenna is performing across all the frequencies you care to check. It also performs many other related measurements, including locating cable faults by using frequency domain reflectometry. The Sark-110 has a built-in battery recharged using its USB interface, which can also be used to connect to it its free chart and analysis software running under Windows; I have not yet had any need to use that PC link yet, other than for transferring files under OS X, and of course for charging. Connect the Sark-110 to the antenna; to preserve its slim form-factor, it does not have a normal antenna socket, but a push-in MCX socket with a short adaptor tail bundled. You will therefore need to attach the appropriate adaptor for your antenna plug to the other end of that tail. Controls seen on the top edge of the Sark-110 case. Turn the Sark-110 on, then flick the Navigator A control to select a menu item on the left of the display, such as Mode, and press the Select button to open that menu item. The submenu appears on the right of the display, and you use the Navigator A control again to move down that submenu to select Multi-band, and press the Select button to enter multi-band mode. 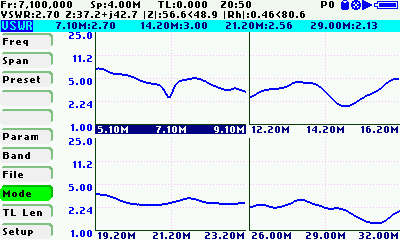 The multi-band test shows VSWR results across the four main amateur operating bands, from 40 to 10 metres. This quickly provides a scalar chart of VSWR (green, and |Zs| in red) across the four main amateur radio bands (40, 20, 15 and 10 m), a good first orientation to the antenna in question. Using the Navigator A to select Preset, then pressing the Select button, you can next choose one of those bands to check in full detail. If you are happy with that band, you can check the next, and so on. Whenever you want, tune the antenna and observe on the display the immediate effects of your actions. Once you are happy with the tuning and results, you can perform your final checks. For a more permanent record of the VSWR performance, take a screenshot by pressing the Save Screen button, or use the File menu to save a data file. 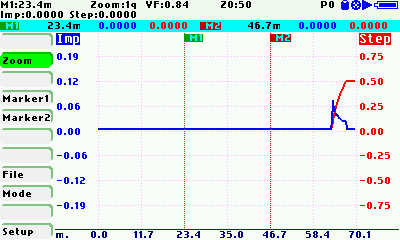 A cable test: the horizontal blue line indicates the cable run is intact and functioning normally. Checking for cable faults is even simpler. Connect the Sark-110 to one end of the cable, with the antenna at the other end. Open the Mode menu, and select the Cable Test item for that. You will need to enter the length of the cable run, and the type of cable used (you can create custom types using your computer). The display will then show a steady flat line if there are no faults, or will tell you where the fault is located, in terms of distance along the cable, and the form of the line gives an indication of the type of fault. The only glitch which I have experienced with this superb product is a strange problem with transferring files from the Sark-110 to my Mac. Once connected by USB and powered up, the Mac sees its internal Flash store as a USB storage device, and image files (in Windows .BMP format) can then be copied from the Sark-110 to the Mac. However sometimes, if the screenshots have only just been taken and the Sark-110 is not powered down before being connected to the Mac, the files do not copy properly, and are reported as being empty or broken once on the Mac. It looks as if they are only being properly closed when the device is shut down. The workaround is simple: take screenshots in the normal way, then shut the device down. After that you can connect it to your Mac, power it up, and the screenshot files should work properly, copying across intact. This device is capable of far more sophisticated and extensive measurements: I have just summarised the features which are currently most important to me at the moment. It is well documented, and full details of its performance, specification, and features are given in the downloadable manual. 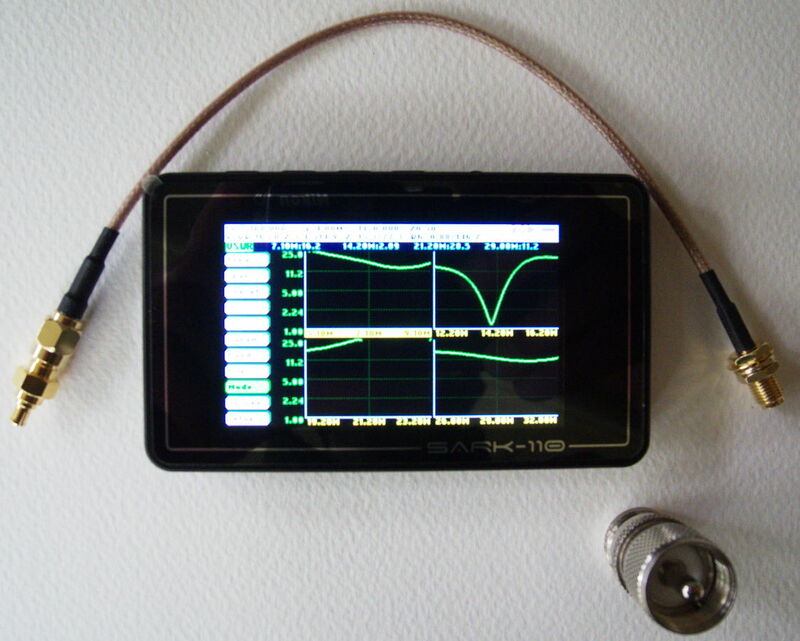 There are a few similar antenna analysers available now, and I am sure that some of them are competitive. However the Sark-110 does the job so well that I am not even going to bother looking at anything else. If you use antennas operating below 230 MHz, you should get one: it is as simple as that. My Sark-110 cost £329.94 (inc VAT) from (outside USA) Martin Lynch & Sons, to whom I am very grateful for its supply, as promptly and efficiently as ever. In the USA, the Sark-110 is available from SteppIR for $389. Posted in Macs, Technology and tagged amateur radio, antenna, cables, ELAD, radio, Sark, SDR, VSWR. Bookmark the permalink. From this article I judge it possible to update the Sark microcode using a MAC OS X rather than a PC. Correct? Thanks. I don’t know: I haven’t tried this yet. Perhaps someone else here has? Yes, the firmware (FW) can be easily updated using Mac OS X. Just download it from http://sark110.com/files/firmware , connect your Sark to your Mac, copy the FW to the Sark, eject the Sark, turn off the Sark, then turn it back on whilst holding down the top left button (triangle and two parallel lines). Current version as of this post is 0.9.1 and is dated Dec. 22, 2016. Thank you very much indeed, John: that is most useful.